The NS 8600 is a 0-6-0 class with a distinctly German appearance. No wonder as they were supplied from German standard production locomotives. The type "Crefeld" standard shunting locomotives were supplied by Hohenzollern in 1912 (4) and 1913 (2), so at the time I bought this kit in 2013, we could celebrate the centennial of the last deliveries! The class was originally built for the Turkish Railways but apparently never delivered for some reason. Hence their Dutch nickname "the Turks". 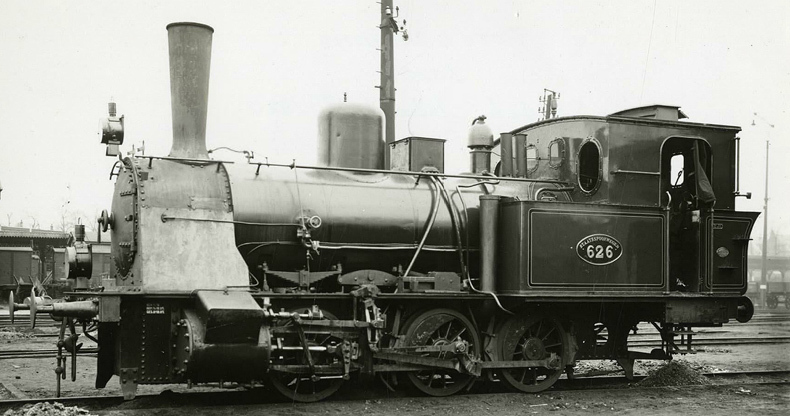 After spending some time in stock they were supplied to the Maatschappij tot exploitatie van Staatsspoorwegen, SS, and the six members of the class were numbered 621-626 (builder's numbers 2908-2909 and 2957-2960). At the amalgamation of the remaining Dutch railway companies into the errrm, well, Dutch Railways the class was renumbered 8601-8606. The 8600's roamed all over the country where ever they were needed. Before WWII the whole class was shedded in Zwolle, Groningen and Heerlen but effectively spread over a far wider area around these depots. After the war the engines roamed individually over the country as tractive force was in high demand and short supply and considerations like efficient maintenance were subordinate to availability. Three members of the class were scrapped as a result of the sustained war damage. They other three were withdrawn in 1951 and 1952. All were scrapped. 8606 in its original SS livery, Utrecht around 1920. Note the excellent state of its paint works despite its diminutive mission. Copyright of this photo is not clear.